It's time to stop letting the PM off the hook. Last week, Theresa May’s government suffered the heaviest defeat in British political history. Last month, her government was – without precedent – found in contempt of Parliament. And last year, the government was exposed to have overseen the reprehensible Windrush Scandal, actively deporting British nationals. Any of these crises in isolation would be enough to expect the Prime Minister’s resignation and the fall of the British government. Each time, we have justified May’s survival with the now tired sentiment of ‘these are not normal times’, as recently articulated by Robert Peston in The Spectator. We’ve all heard it after the latest Cabinet resignation or policy blunder; ‘Yes, in normal times she’d be a goner, but these are not normal times…’. This rhetoric has to stop. We cannot keep using Brexit, parliamentary arithmetic, or the era of Trump and ‘post-truth politics’ to explain away a government in chaos refusing to leave office for the good of the country. Because we better get used to them – and we better start holding our government to account. British Prime Ministers have resigned in the past over comparably damning circumstances to those May has faced since taking office. Wilson left office in 1976 after a humiliating bailout from the IMF. Eden swiftly departed in 1957 after the calamitous Suez Crisis. Were they governing through ‘normal times’? Even in more recent memory, whilst many resent Cameron for hubristically calling a referendum to settle an internal party squabble and promptly doing a runner, could he really have been expected to stay on? He won an election and staked his reputation on a referendum he lost even with the Whitehall machinery onside. The vote bitterly divided our nation in two, inflicting wounds that show no sign of healing. Could the charlatan who led us down this garden path really be trusted to steer us back on course? He had to go. Generally, politicians don’t choose their political retirements: either failing victim to their electorates or scandals of a personal or political nature that force them into shameful, or less common, dignified resignations. Of course, May sped past the turnoff for ‘dignified resignation’ several exits ago, but she must still deliver us her notice. Constitutional convention demands it, and the general public deserve it. Since May’s coronation to Downing Street there has been a mythos created around her – pushed by her spin doctors and allies in the media – that she is the reluctant, dutiful leader putting country before personal ambition. How often have we heard leading political figures express sympathy for May’s position? Can you count the number of times you’ve heard commentators praise her tenacity, survivability and sense of duty? But this perception that has been so expertly diffused into public consciousness is pure fiction. The political class act as if May never wanted to be Prime Minister. It must be lost on them that May was the politician who announced her ambition with the ‘nasty party’ speech as early as 2002. That she spent her time in Cameron’s cabinet jostling for position and that she was suspiciously quiet during the referendum. And that she called a General Election on the back of a solid poll lead in order to wipe out the Labour Party and shore up her premiership. Not to mention the moment she pulled £1bn out of the ‘magic money tree’ to allow her to stay on top. I don’t sympathise with Theresa May. She’s been planning her premiership for years, and the British public should not coddle her because it’s not panning out how she’d hoped. This is the architect of the ‘hostile environment’ and ‘Go Home Vans’; an enthusiastic proponent of austerity and policies that target the most vulnerable in our society. And she is increasingly proving that she is more interested in holding on to power and securing her legacy by any means necessary – even if that means restoring the whip to MPs under investigations for sexual misconduct on the day of her confidence vote. 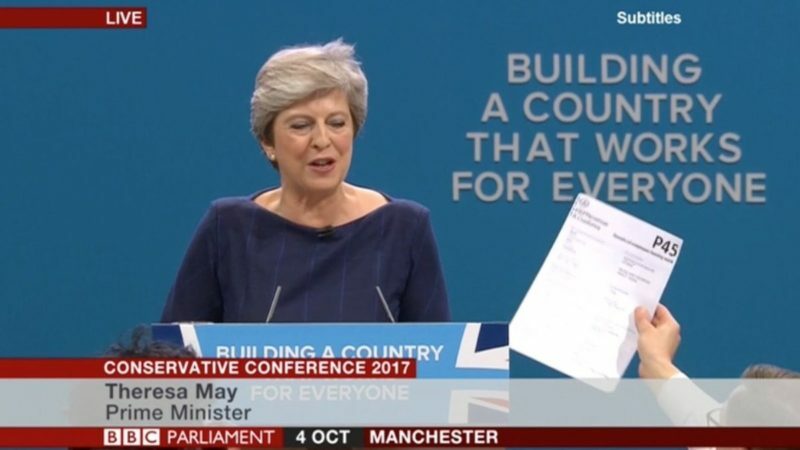 So, forgive me if I didn’t shed a tear when some letters fell down behind her and she coughed her way through a landmark conference speech. Theresa May is no sympathetic, dutiful leader putting country first. She is desperately clinging on to power without regard for convention, legitimacy or public interest. These May not be normal times, but Theresa May is not a passive victim of this: she is leading this country’s downfall to save her skin. Nathan Phillips was South East Coordinator for both of Jeremy Corbyn’s Labour leadership campaigns, and currently works for a Labour MP.